Edinburgh instantly grabbed me as a city I could probably live in. From the fantastic cheap hostel (Globetrotter, definitely stay here if your ever out this way) and the cheap transport to its historic charm, it just seemed to fit. If we ever do another working holiday, this will be high on my list. I’m going to list the days events out of order to mix things up a little with this post, I hope it makes sense. The photo above is a view of Edinburgh looking towards the sea. 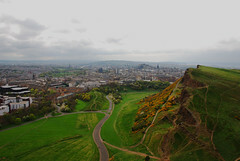 I took it from Arthur’s Seat, the main peak of the mountain range that forms Holyrood Park. Holyrood park contains the ruins of Holyrood Palace where the coronations of the Kings and Queens of Scotland took place. I climbed the mountain you see in front and the one the photo was taken from in the afternoon while Gemma rested in the grass below. Its very steep in places but well worth the effort. From Holyrood Park the ‘Royal Mile’ stretches up towards Edinburgh Castle. If you click the photo to see one of the larger versions you will find Edinburgh Castle just to the right of dead centre. As with Jedburgh Abbey yesterday we were able to see this for free this weekend. We wandered the castle grounds getting a good look at parts of Edinburgh and also checked out the Honours of Scotland (Scottish Crown Jewels). Before heading back to our hostel we met up with Gemma’s friends Jodie and Tammy for a meal. It was good fun catching up on each others travel’s and we were especially grateful that they new a good inexpensive place to eat, the conversion rate is chewing through the poor Australian/Candian dollars we have!